I just LOVE the tea-riffic set. There are so many sentiments and bits and pieces in this set. I have so many more ideas. For my card today, i colored the teacups to match my favorite piece of Crate paper, and then added ribbon, lace, flower, and some diecuts. I think the sentiment finishes it off perfectly. A bit casual for me, considering i usually have way more layers, but i'm still happy with the end result. I also followed Jen's deconstructed sketch from last week. We are totally zen on the TGF BLOG today too (ok, we are bursting with excitement about tomorrow, but we are TRYING to be, anyway! ), so be sure to head over for more project inspiration and another chance to WIN "Teariffic" today! Thanks, as always for stopping by and I'll see you tomorrow for ALL the excitement! Hey, everyone! I'm back and excited to bring you the next preview from our October Release at The Greeting Farm! After the popularity of our Anya and Ian "wardrobe" sets a few years ago where you could build your own outfits, we've decided to give the wee-ones a turn to be fashionable and introduce you to "BUILD A ONESIE: girl!" 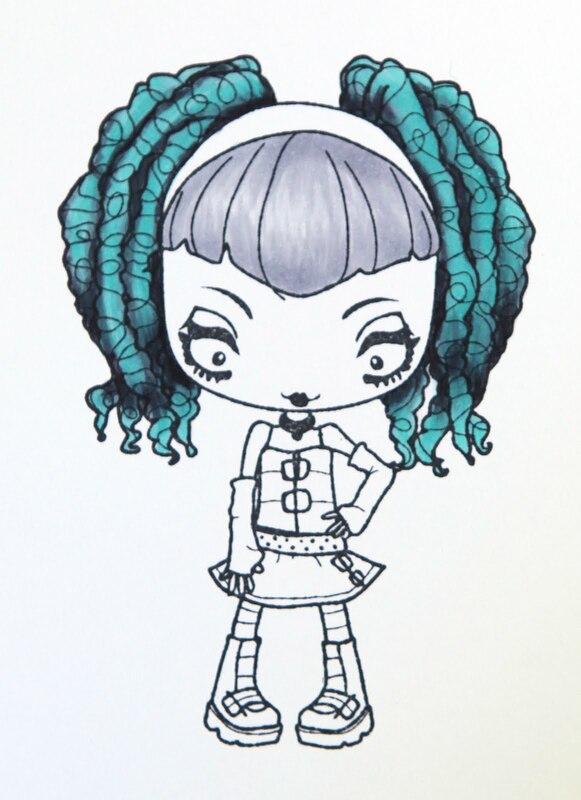 This sweet set of cute couture will be available in CLEAR polymer when it's released on October 1st! Be sure to visit the TGF BLOG today to see how you can WIN a set of your own today! Thanks again for stopping by and see you soon! In the meantime, be sure to check out the TGF BLOG every day to stay tuned into our week-long October preview week! Hello, Farm Friends! It's hard to believe that in a few short months, we'll be twirling into Thanksgiving, caroling into Christmas, and putting some HEART in the HOLIDAYS! While we don't want to rush any of the magical times ahead , we know that it takes time and energy to get a head start on those Holiday cards! Today marks day one of a FIVE-day PREVIEW EVENT at The Greeting Farm, and we are thrilled to bring you our first sneak peek at a new CLEAR stamp set, simply titled "CLEAR CHRISTMAS!" Before we get to previews, we have a SUPER special October Guest Designer to announce today! Please welcome the amazingly sweet and talented LORI CRAIG to our TGF family this month! Lori's blog, "Make a Difference" is inspiring and from the heart, you'll definitely want to visit and we are over the moon that she is joining us this month. WELCOME. LORI! So without further ado, here is my off-the-page project for today.....a CHRISTMAS BON-BON. I've used Kraft wrapping paper to begin with, and stamped it all over with some of the snowflakes from today's new set. Unfortunately, it hasn't shown up too well in the photo. It was meant to be subtle, but not invisible! I've then decorated my project with more TGF stamps , and Echo Park christmas paper, that i have diecut using various shapes. I think my color combo will suit my Christmas lunch celebrations perfectly. I have only used four stamps from the Christmas set. There are way more in it, and i have already made a card too that i will save for another day. Well, does that get you in the spirit, even though it's a little early? We hope so! Don't forget to check out the TGF BLOG today for MORE samples from the entire DT and a chance to WIN this set before it's released! What's more? We have a HUGE announcement coming on SATURDAY, OCTOBER 1st during our RELEASE day post and you will NOT want to miss this one...promise! Not only do we have a new release coming, a new Challenge Team coming October 1st...we have ONE more exciting announcement and it might just be our best one YET! Thanks for stopping by today...I will definitely be back with more very soon! Here i am, quickly popping in to show you a thank-you card i made using Boho Anya from TGF. There was a tutorial on the copic oz blog showing how to color back hair and darker colored skin tones a little while back. I loved Kathy J's card so much that i used her sketch for this card. Make sure you check back later today for the very first October preview from The Greeting Farm. you won't want to miss it. Hi there. Sorry I haven't been around much in the last couple of weeks. There has been way too much going on in my crazy life to even begin to explain, so let's just say, I'M BACK! Finally had a few hours in the house alone today, and bet you can guess where I headed. Yes, the scrap room, which by the way, is one BIG mess. I would take a photo, but it is way too embarrassing to show....maybe when I've cleaned it up a little. So, I have 2 cards to share today. The first one is WS Logan. You know how sometimes you make a card and it turns out even better than you anticipated. Well, this is one of them. I stamped Logan onto Xpress blending card, paper-pieced his hoodie and colored him in copics. I then masked him off and added the splotchy TGF background stamp and the airbrushed background colors. 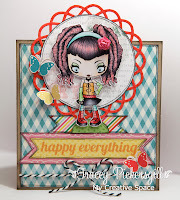 I had a white doodlebug border strip, so decided to use my airbrush to make this match the background. I am really happy with the finished product. It was Father's Day here a couple of weeks ago. I have made this to give to DH (late, i know), but I like it so much i just may have to keep it, LOL. I have followed Jen's deconstructed sketch this week. Check out her blog here. Here's her sketch, which I found really easy to follow. Think I might keep this one for future reference. My other card is a remake of Cheeky Kitty. Sometimes I also make cards that I really am NOT happy with, and the Cheeky Kitty card from my very last post was one of these. So, today I decided to play a little, and I am much happier with the final product. Still not my favorite card, but you'd have to agree, it is much improved. 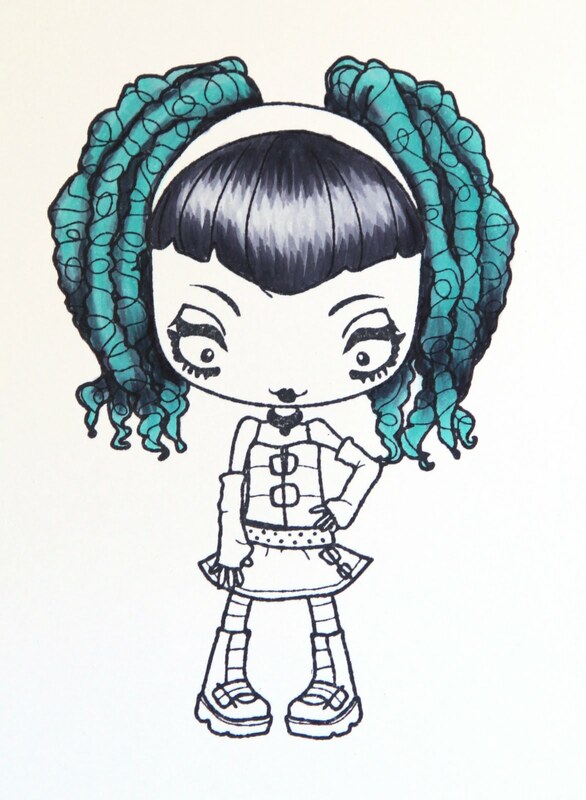 Today i'm showing a cute new CHEEKY digi that will be released in the TGF store on the 15th of September. Her name is Cheeky Kitty, and she is perfect for Halloween cards, but could also be used for lots of other occasions too, as i have done. I have joined in the WOW challenge over at the farm fresh challenge blog. This week is a sketch challenge and here's the sketch. And here's my Cheeky Kitty. It's the first time i've colored a Cheeky image, and i had lots of fun. Her outfit is colored in red spica so is quite glittery. Doesn't show up too well in the photo though. Sketch challenges are always fun, so why don't you join in this week. I don't like to put personal things on my "creative" blog but sometimes you've just got to bend the rules. We have just returned from 3 days on King Island, a tiny Island approx 25 km wide by 65 km long in the middle of the Bass Strait (ie. between mainland Australia and Tasmania) We flew over in a TINY plane but it was definitely worth the extreme motion sickness to be reunited with annabel for a few days. There were only a few set times for us to spend together and these included four hours saturday afternoon spent together. We travelled around the island taking in a few sights together including the Currie township, Cape Wickham Lighthouse, King Island Dairy, and Martha Lavinia beach. We were invited back to the campus Saturday evening for dinner, cooked by Annabel and her 6 housemates. They did a wonderful job. Sunday's activities included an aquathon where all the students swam 480m then ran 2.4km i think. Following this, the students helped run the annual Grassy Wintermarket that they had baked all day Friday for. Once again they did a fabulous job and we were so proud of our beautiful girl, and all that she has achieved while on King Island. Here are just a couple of pics. Congrats Tricia. 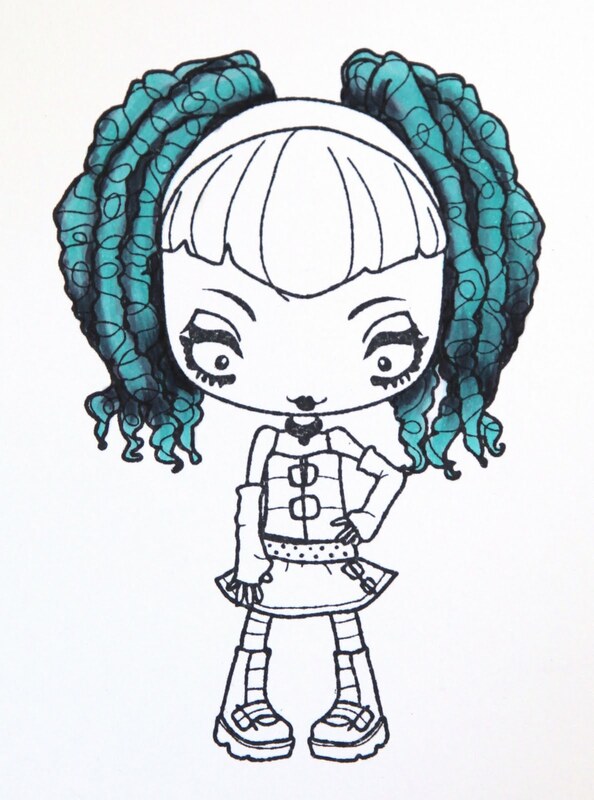 One blue haired LULA card coming your way. Could you please email me your mailing address so that i can send it out to you. My email is paley at netconnect dot com dot au. And of course it wouldn't be a blog post without a photo, so here's MISS ANYA BAGS with paper-piecing using my favorite fabric adhesive paper. This card is for a special friend whose birthday is on Saturday. Hopefully she doesn't read my blog! I'm off to King Island now to visit my Gorgeous 15 year old daughter who has been living there for 8 weeks for school. I am so excited about finally getting to see her again after SO long. I'm just not looking forward to the plane trip to get there! i think it's a 12 seater! Could even be smaller! It will definitely be worth it to see my girl though. Miss you Annabel. I followed the sketch over at the deconstructed sketch this week. A super-easy sketch this week, which always speeds up my card-making process (thanks Jen!). It's a little difficult to see in the photo, but there's a fair bit of sparkle going on. 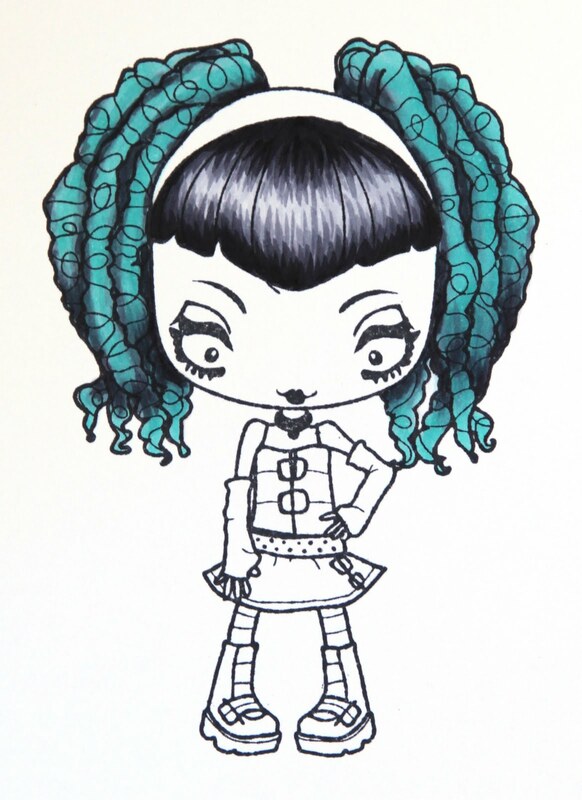 Lula has black spica on her necklace, buckles and eyes, and i have also used clear spica on the oval frame. I cut the beaded oval frame from my nestie in pink paper. 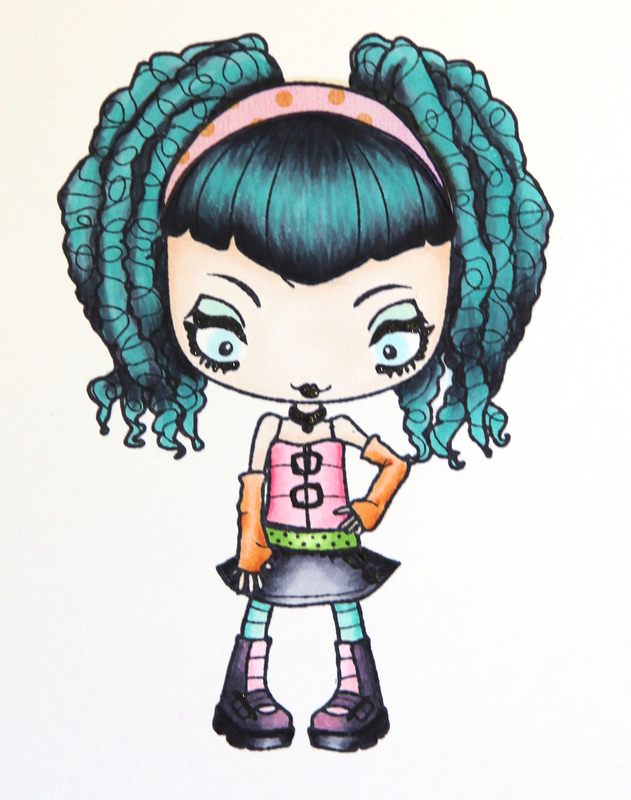 I then left the die in place and airbrushed with orange copic. (YR12 i think) Finally i used my clear spica in the airbrush to give the orange beads a little sparkle! As i mentioned yesterday, if you would like to be the someone special who receives my LULA CARD, then all you have to do is leave a comment on this blog post, and then become a follower of my blog if you are not already. Simple. I'd love you to tell me what you like about my blog, and/or what you would like to see more/less of, but any (nice) comments at all would be lovely. I will draw a random winner from your comments after 48hrs. My one year "blogaversary" is coming up on the 11th of October, so i am busy putting together a big birthday blog candy! I'd love to aim for a magic number of followers, but not really sure what to aim for, so i guess i'll just wait and see. See you back here in 48hrs. Don't forget to check back, as i'll need the mailing address of the winner. Hi there all, and Happy Monday to you. Today is my day in the spotlight, so i thought i'd repeat my post from TGF blog here so no-one misses out. How much did you enjoy the SPECTACULAR SEPTEMBER BLOG HOP last week? Aren't the stamps all AWESOME, and how about the DT samples? I always love seeing all the different projects everyone comes up with. So i thought i'd give you a mini-tutorial on how to color this groovy-looking hair. I'm not clever enough to video myself coloring, so i have taken lots of pics along the way. Let's get started. The first pic is of Creeper Lula with her ringlets colored blue. 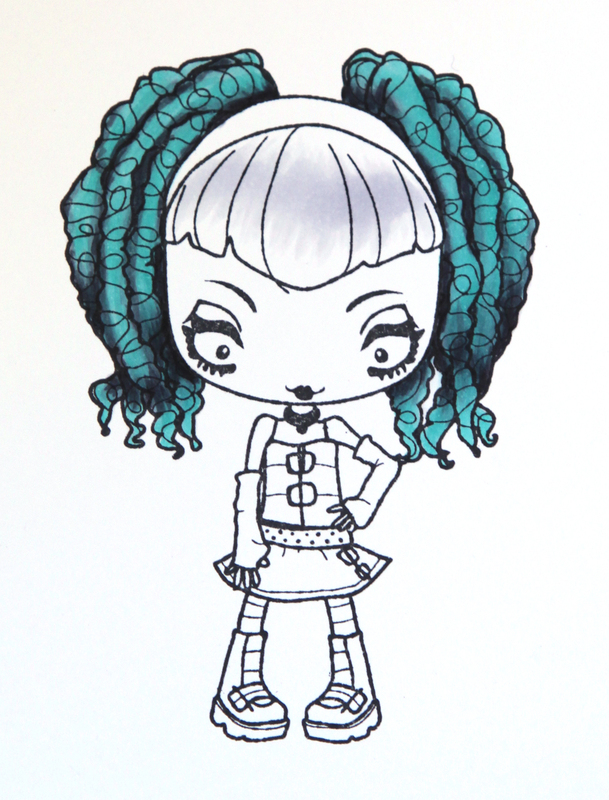 I have left her fringe blank so that i can show you step by step how i color it. 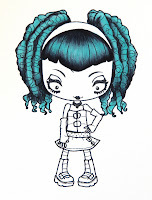 The second pic i have started by coloring with C1 in the area of her fringe that will be the lightest. I decide where to have my highlights by thinking about where the light source is, and where her hair would be shiny in real life. Next i have taken C3 and colored from the upper and lower edges of her fringe in a flicking motion towards the centre. I follow the lines of her hair that are already on the image so that the strokes look like hair. I'm not too fussy here as i know that i can add more hair lines later. In the next two pics i have added C5 and C7 in the same manner, with each darker color flicking less distance towards the lighter area. You can see how her hair is starting to look 3 dimensional already. Next i have added C9 in the same manner, and then a few brushstrokes with C5 to give the look of strands of hair. So, there you have regular black hair. (which by the way, has no black in it, only cool greys) Now, in order to transform it into any funky color you like i go ahead and color right over the top of the entire area i have just colored in whichever color i choose. Today i have used BG13, as i have a particular designer paper in mind that i would like to use. 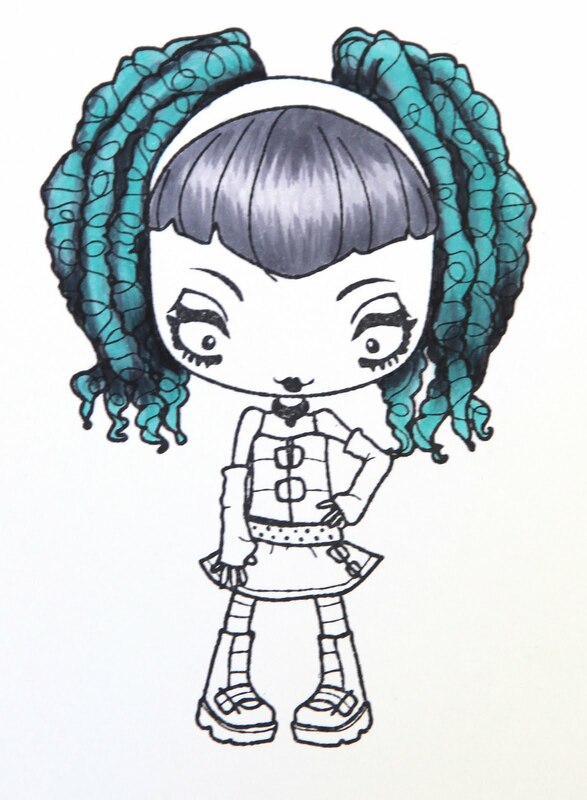 Last but not least, a quick splash of color all over to finish her off, and a paper-pieced headband and we have a pretty cute CREEPER LULA all ready to pop on a card for someone special. Speaking of someone special, i will be making this LULA into a card that i will display on my blog tomorrow. If you are the someone special who would like to win my card, then make sure you visit my blog tomorrow to see my card, leave a comment, and become a follower of my blog if you're not already. 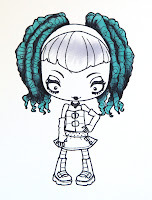 I'll then choose a random commenter to send my blue-haired LULA card to. I hope you have enjoyed my mini-tutorial on HAIR, and have a fabulous week of craftiness.